While in the grocery store with my kiddos yesterday, we bought a few poppies from a nice man. My kids were really interested in why we were buying these poppies and why other people they saw were wearing them on their jackets. Spur of the moment, I decided I would make them a snack when we got home and have a little discussion about what Remembrance Day is all about. Seeing as my kids are only preschool age, I didn’t get into the details too much, but I wanted them to know that Remembrance Day is a day where Canadians honour and remember those who have fought for our country. People all over Canada buy and wear poppies to help remember and they are a symbol of Remembrance Day. This little snack was super easy to make, not to mention healthy too. Here’s how I made it. 1. 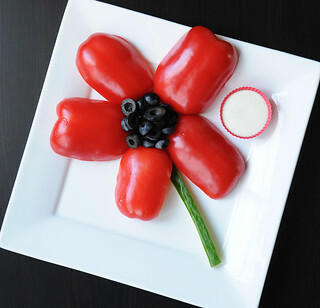 On a plate, arrange your red pepper segments into a flower shape. 2. Fill the centre of the flower with your black olives. 3. Place your cucumber stem on the flower. With Remembrance Day this week, this is a perfect and easy snack to help introduce what Remembrance Day is all about to little ones. My kids loved the snack and after our little discussion, they now know why they are proudly wearing a poppy on their jacket this time of year.